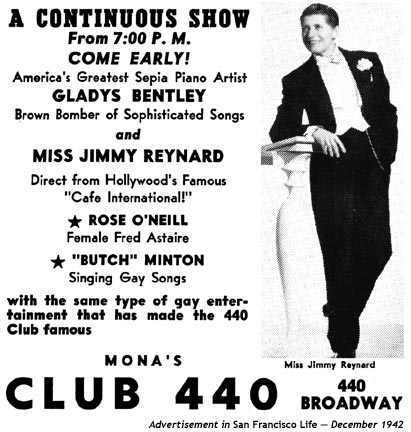 Advertisement for Mona's Club 440 in 1942, with the explicit use of the word "gay" featured prominently. The word "gay" during the 1940s also denoted "happy," and to the casual reader even the reference to "butch," meaning masculine in gay argot, might have escaped attention. However, the discerning, sophisticated, 1942 reader would quickly understand that Mona's Club 440 catered to an almost exclusively woman audience during World War II. "Perhaps the most famous gay-oriented club of the era was Harry Hansberry's Clam House, a narrow, smoky speakeasy on 133rd Street. The Clam House featured Gladys Bentley, a 250-pound, masculine, darkskinned lesbian, who performed all night long in a white tuxedo and top hat. Bentley, a talented pianist with a magnificent, growling voice, was celebrated for inventing obscene lyrics to popular contemporary melodies. Langston Hughes called her 'an amazing exhibition of musical energy.'" Gladys Bentley, "Brown Bomber of Sophisticated Songs," who was born in Philadelphia, Jan. 12, 1907 and died Jan. 18,1960, appeared, during the early 1930s, at Harlem's Ubangi Club, backed by a chorus of men in drag. Bentley moved to the Southern California during the late 1930s, and appeared, as this advertisement attests, in San Francisco during the 1940s as "America's Greatest Sepia Piano Artist." Gladys Bentley can be heard here singing and playing Worried Blues, recorded as OKEH 8610, in 1928. Mona's Club 440 later became Anne's 440, and featured San Francisco singer Johnny Mathis. Today it is the Club Chi-Chi.